Located in Lukang Town of Changhua County, Taiwan, Lukang Old Street is famed for its well-preserved cultural and historical heritages, as well as old-time flavors that attract large number of both local and international visitors each day. Lukang Town is one of Taiwan’s oldest towns and Lukang Old Street was the main business district of Lukang Town back in the early days. Lukang old town was once a bustling port during the Qing Dynasty in the 1600s and continued to be a thriving business center until 1895 when the Japanese came. The name Lukang, literally means “Deer Harbor”, was given as it was the main harbor for exporting deerskin during the Dutch Colonial Period. Lukang Old Street is filled by traditional Taiwanese style houses with carved doorways and windows, intricately designed arches over the main entrance, thin red brick walls and red tiled road, as well as retro green mailboxes hanging outside the houses boasting an antique charm. Through a walk down the winding alleys of Lukang Old Street, one may still find the old glories of the town. Many of the old houses are still used for business run by the residents, while a few have been renovated but still preserved as a reminder of the past heritage. With the location facing the Taiwan Strait, Lukang Old Street is famed for its wide arrays of seafood and old-time flavors, including Thick Soup with Duck Meatball, Fried Mud Shrimp, Oyster Omelet, Fried Oyster, Shrimp Ball, Yuzhenzhai’s cakes, Phoenix Eye Cake, Green Bean Cake, Ox Tongue Biscuits, and steamed meat buns. Also, the traditional stores, shops and stalls feature an extensive range of handicrafts, antique toys, paper lanterns and many others in a nostalgic environment that will make one’s Taiwan travel a memorable one. 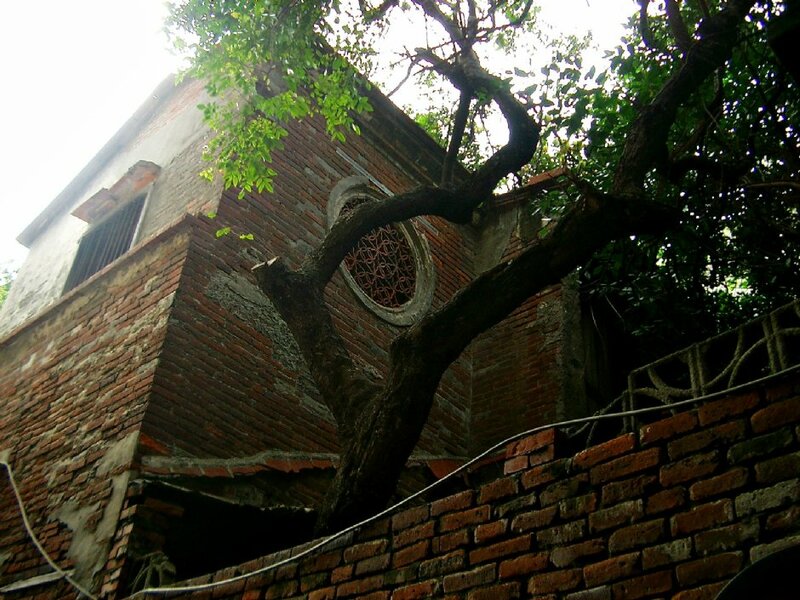 Adjacent to Lukang Old Street, one may find “Molu Lane (Chest Touching Lane)”. The alley was named because it’s so narrow that only one person can pass at a time. If two people intend to walk through at the same time, there is a high chance that their chests will touch. Later, as more and more scholars moved here, Molu Lane was eventually renamed “Gentlemen’s Lane”. Lukang Town is also well-known for having the most gorgeous temples in Taiwan. The two most famous temples in Lukang are Longshan Temple and Tienhou Temple. Lukang Longshan Temple is the largest temple in Lukang, highly valued as the Hall of Taiwanese Art & Culture and the Treasure of Chinese Architecture. The temple is known as the first Buddhist temple in Taiwan, constructed during the Ming Dynasty, and has been named class 1 historical site of Taiwan that attracts architecture researchers from all over the word. Tienhou Temple (Matzu Temple) is another historical temple that one should not miss when visiting Lukang old town. The temple is a Daoist temple dedicated to Matsu (The Goddess of the Sea). The Matsu image was brought to Taiwan by a general in Qing Dynasty. “The Black-Faced Matsu” has a black appearance from years of incense smoke that have covered over her original contrast. Other than appreciating the exquisite carvings and the image of Black-Faced Matzu, visitors are also recommended to see the four little statues on the gates, each figure are said to represent 4 of the greatest pleasures in life such as “ear-picking”, “back scratching”, “yawning” and “nose-picking”. Also check out the front of the temple for a cool display of old weapons. The area around the temple is pedestrian only and great crowds gather here during the weekends as a great market filled with vendors and local Taiwanese snacks are available, offering guests and tourists a festive atmosphere rather than a tourist location. With extensive traditional snacks and well-preserved architectures and cultures, the past is revealed authentically in Lukang Town. Take train to Changhua Train Station -> Take Changhua Bus bound for Lukang at Changhua Bus Station, which is located on the opposite side of Changhua Train Station -> Changhua Bus Lukang Terminus -> Lukang Old Street is about a 10 minute walk from the bus terminus.